Wendy Deichmann on "The Sturdy Anchor of Doctrine"
Wendy Deichmann, President of United Theological Seminary, has written a very fine article in Catalyst on the role of doctrine in United Methodist theological education. I commend it to you for perusal and consideration. United Theological Seminary student Joseph Graves has written some really insightful posts on miracles and Christian belief. I strongly recommend checking them out and getting into the conversation. You can get to his blog by clicking here. The following is an excerpt from the talk that I'm giving in Cleveland tomorrow for the Values and Faith Alliance event, "Changing Perspectives: Spirituality and Service." The gift of God’s love is not based upon ability, but upon the sheer generosity of God, expressed in the Incarnation. God did not come to us in Christ because of something that we did. God came to us in Christ because that’s the kind of being God is. God reached out to us and personally invited us to participate in the mutual love of the Father, Son, and Holy Spirit. The Bible does not tell us that God was so impressed with humanity that he gave his only Son, or that God thought that human beings had so much potential, or that God found human beings to be so good looking, or that humans were doing such great things that he gave his only Son. Rather, Scripture teaches us that God so loved the world that he gave his only Son, an event that took place in the Incarnation. This is sheerly an act of self-giving, an act of pure generosity that is extended to each of us, regardless of ability. The Incarnation, then, is a great leveler, because Christ is given to each of us without regard for anything we might think, say, or do. It is universal in its scope. This can become experientially real for us in the sacraments. I sit on my local District Committee on Ordained Ministry and conference Board of Ordained Ministry, and every candidate who comes before us for ordination is asked about the sacraments. This can be a frustrating exercise because so many of our candidates have a decidedly un-Wesleyan view of the sacraments. Too often, they think of them as remembrances or memorials. In fact, the sacraments are first and foremost neither of these. Sacraments are means of grace. They are ports of entry into the life of the Trinity. The primary agent in baptism and holy communion is God--not the pastor, not the laity, but God. Should we then baptize people with profound cognitive disabilities? Absolutely. God’s grace will be poured out on that person as well. Should we give communion to people who lack the cognitive ability to grasp its basic meaning? Absolutely. God’s grace is not dependent upon the ability of the recipient to comprehend what is happening. The full effects of this grace for each of us, regardless of ability, will only be realized in the age to come. God is making all things new, including people with profound cognitive disabilities. The most recent issue of Good News includes an excellent article on disability ministries. Among other things, it discusses what these ministries contribute to the life of the church, how they touch the lives of families, and some initial considerations for starting these types of programs. There's an online version of the article here. I'm grateful to the folks at Good News for running this piece. People with disabilities come from all walks of life, though they are often excluded from the life of the church. Most churches lack the theological, practical, and material resources to welcome a broad array of people with disabilities. Conditions such as autism, Down Syndrome, various physical disabilities, and Alzheimer’s can prevent people from full participation in the Body of Christ. The renewal of the Church is a renewal of faithfulness. This year’s Light the Fire conference will equip clergy and laity to be faithful in ministry with people with disabilities. Speakers will include Marva Dawn, Bill Gaventa, Barb Newman, Jeremy Schipper, and Mike Slaughter. We will also have breakout sessions on ministry with people who are experiencing PTSD, depression, autism, and Alzheimers/dementia, as well as sessions on setting up a disability-friendly church and establishing recovery ministries. 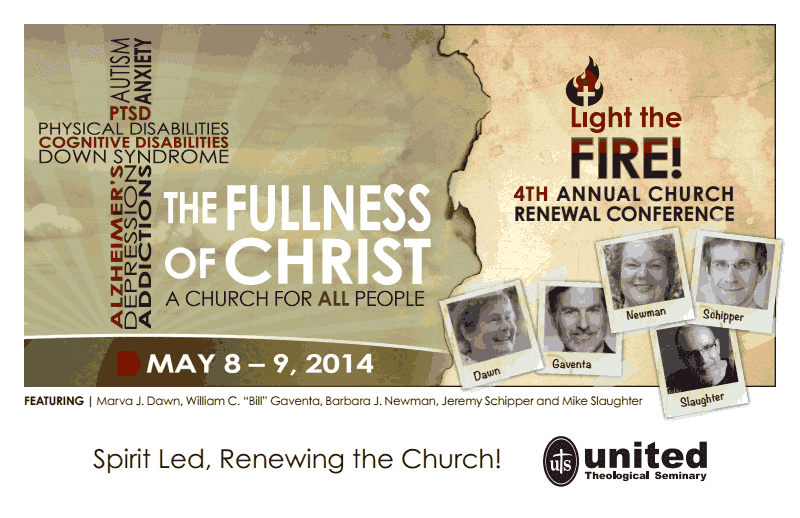 You can access United's event page for this conference by clicking here. O Christ, who alone art our Defender: Visit and heal Thy suffering servant, delivering her from sickness and grievous pains. Raise her up that she may sing to Thee and praise Thee without ceasing, O Thou who alone lovest humankind, in the name of the Father, Son, and Holy Spirit. Earlier this year Billy Abraham and I published a book together called Key United Methodist Beliefs. The book started out simply as a catechism, but soon morphed into a ten chapter account of the Christian faith from a Wesleyan perspective. Obviously, you don't write that kind of book unless the Church's central doctrinal heritage is important to you. In fact, for both of us, it is quite important, and we are concerned about the loss of this heritage over the last 45 years in the UMC. To be clear, one can find abundant good in the UMC and the Wesleyan/Methodist movement more broadly. We have long been a socially minded people. A recent example of this is the Imagine No Malaria campaign. We have, at times, been incredibly effective evangelists. One could think of the Wesleyan movement as the longest sustained revival in history. We have produced many fine educational institutions. In fact, according to GBHEM, there are over 700 Wesleyan schools, colleges, and universities worldwide. Yet one place where we haven't done as well, particularly in the UMC, is in defining our doctrinal commitments. This is an area for continued work and improvement. On October 26, Dr. Abraham and I will speak at United Theological Seminary on the importance of core, historic Christian beliefs within the UMC. The discussion will take as its point of departure the book that we wrote together. This event is sponsored jointly by United Theological Seminary and the Evangelical Fellowship of West Ohio. If you have any interest in discussing these matters, I hope you can make it. To learn more about the event, click here.